Why do you need a stable kayak? Simply, stability is key to your Safety, Comfort, and Successful Fishing. Without it, you could end up swimming, or worse – drowned, and if you happen to lose balance, you could also lose some precious gear that would slide down from the deck and into the water, never to be seen again. Any stability issue that you have to deal with while fishing automatically draws mental and physical resources from you, and mobilizes them for the task of keeping you balanced, and your kayak level. This continuous effort affects muscle tension in your legs, your back and your shoulders, and it reduces your casting performance, as well as your ability to turn and to focus. But most importantly, the feeling of instability leads to discomfort, and this hurts your well being. In other words, fishing out of unstable or insufficiently stable kayak is not fun. Under such conditions, your ability to land big and powerful fish is significantly reduced, and you can’t expect to be very successful in your fishing trip. Now you know the reason why despite the fact that kayak fishing looks so easy, simple and fun, and most kayaks are cheaper and easier to transport than boats, the number of kayak anglers has stayed stable in recent years, after years of growth. Many people have tried fishing out of kayaks, but the combined effect of instability, wetness, discomfort and back pain, and not enough catching has led many of them to quick this sport, or outdoor activity. What’s the most popular fishing kayak? The primary concern of any angler who fishes out of kayak is stability, of course. The inherent poor stability that kayaks offer make it the first and foremost concern, which is why fishing kayaks are typically much wider and often bigger than kayaks used for Recreation, Touring, and obviously speed competition. The fear of capsizing their kayaks and the potentially disastrous results of such event drives kayak fishermen toward sit-on-top (SOT) kayaks, and therefore, they are more popular than sit-in kayaks. Are SOT kayaks more stable? In this context, it’s interesting to observe that people who fish from boats are frequently seen standing, while people who fish from kayaks rarely stand up in them. The reason for this is stability, or lack thereof in kayaks. What’s the problem with big SOT fishing kayaks? 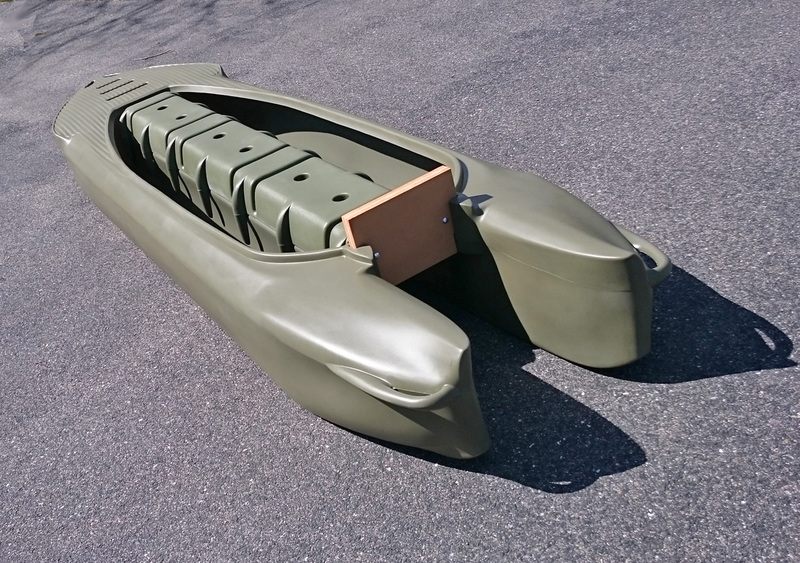 The problem that users of big SOT fishing kayaks users face is twofold – First, these behemoths are are to transport and carry, and the biggest can hardly be moved even on land. Second, these huge kayaks don’t paddle well – They are slow, hard to move, they track poorly, and they are mostly for short trips on flat water. People who are not in good shape find it hard to handle these large size SOT kayaks, both on land and on water. 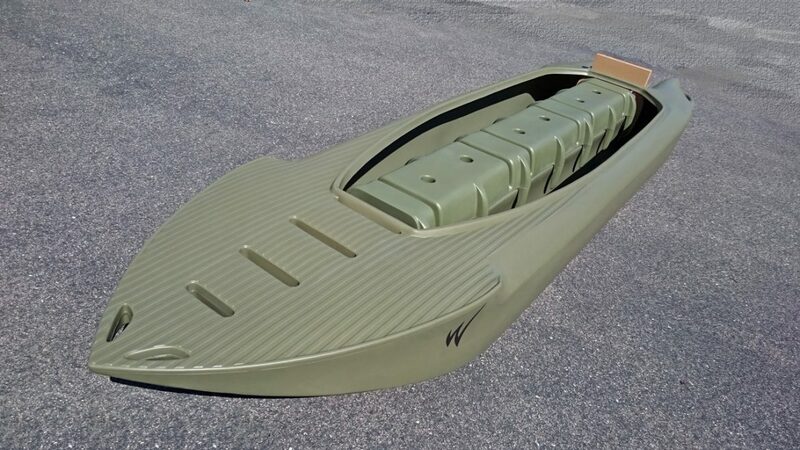 The same people also find these kayaks to be most uncomfortable. What is the most stable kayak? The Wavewalk S4 twin-hull is the world’s most stable kayak, and it beats kayaks that are much bigger and wider. Three large size guys can easily fish out of an S4 standing up, in full confidence and comfort. 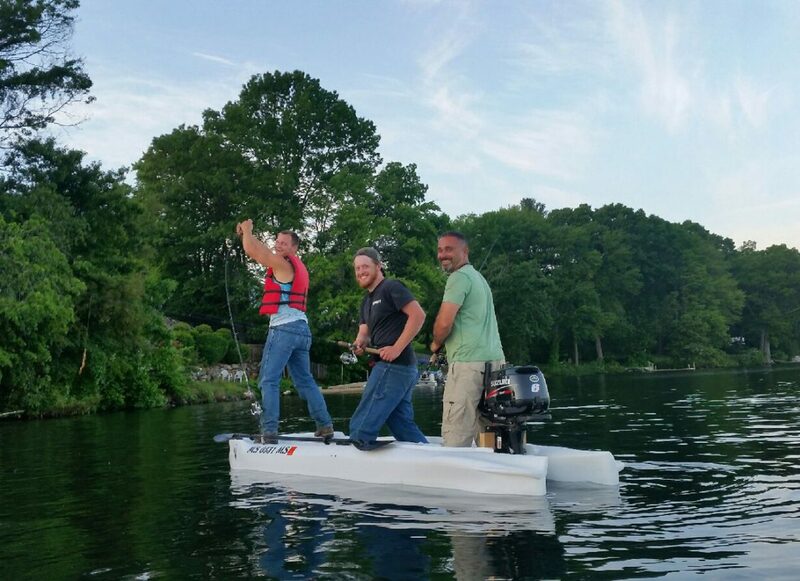 The S4 powered by a 10 HP outboard gas motor can go at full throttle in rough water, in the ocean, and its driver can stand up while driving it. Three adult passengers can stand up in a Wavewalk S4 and paddle without any balancing or stabilizing issues. 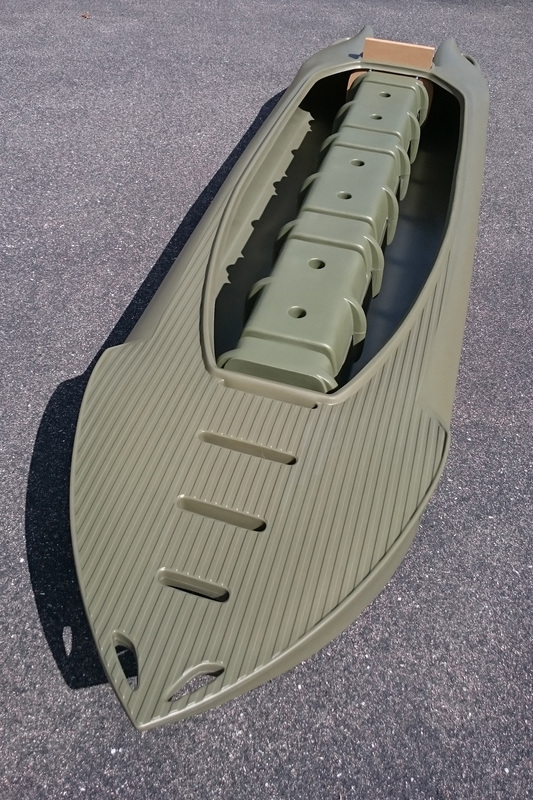 What makes this kayak more stable? The sides of the Wavewalk S4 are more buoyant than the sides of ordinary (SOT and sit-in) kayaks, which are generally oval. 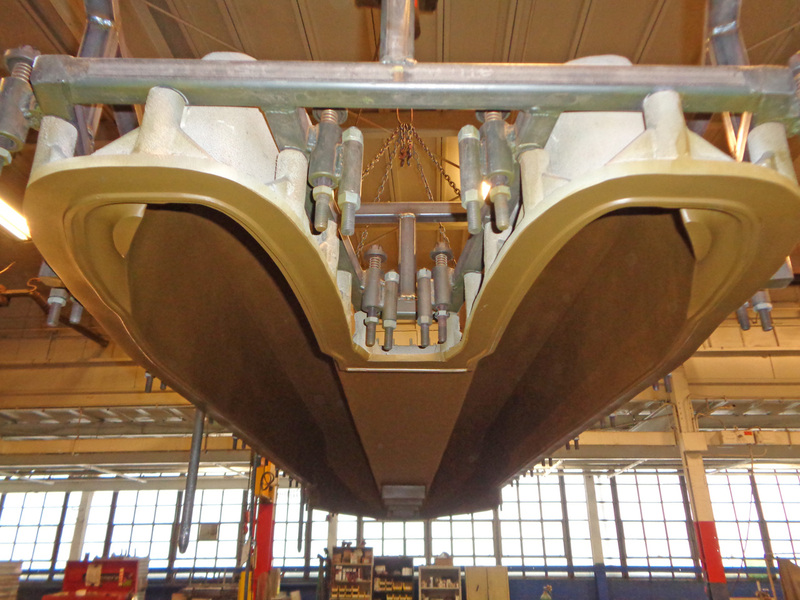 The S4 features two large size, straight hulls, separated by a wide saddle seat. The people who sit on its saddle have their feet rest at the lowest point of the hulls, and the same is true when they stand up. The riding posture is similar to the posture of people who ride large jet-skis, ATVs, snowmobiles, and dirt bikes. The posture offers a higher degree of balancing capability that simply sitting with our knees in front of you, such as when you sit on a canoe or Jon-boat bench, and it is also more stable than the very unstable and most uncomfortable L position, where your legs are stretched in front of you. Here are some images that show the S4 in the new Gator Drab Green color. 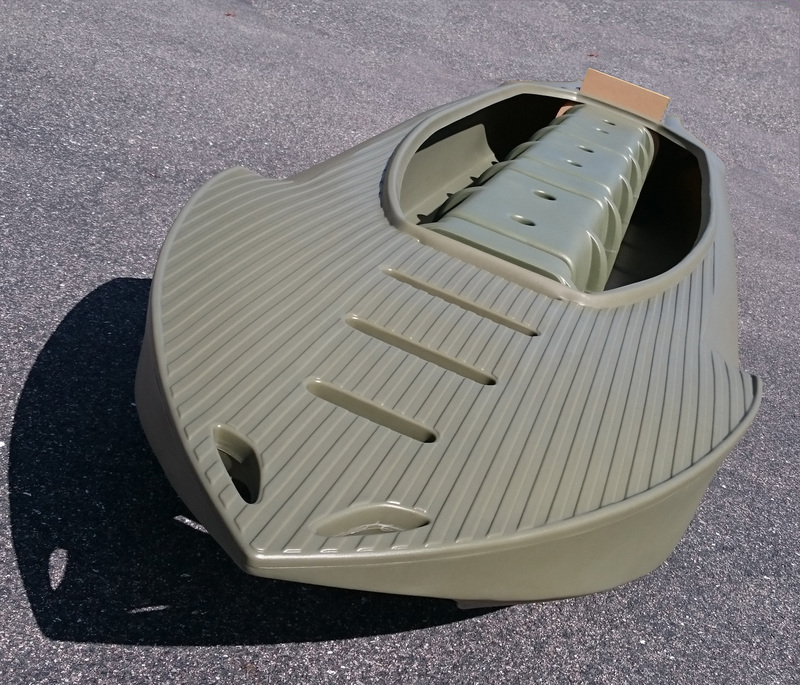 This color and similar ones are popular among Jon boat users, since it blends well with the surroundings in inland fisheries, and it serves as a good base for camouflage. Duck hunters will be interested in it as well, for similar reasons. 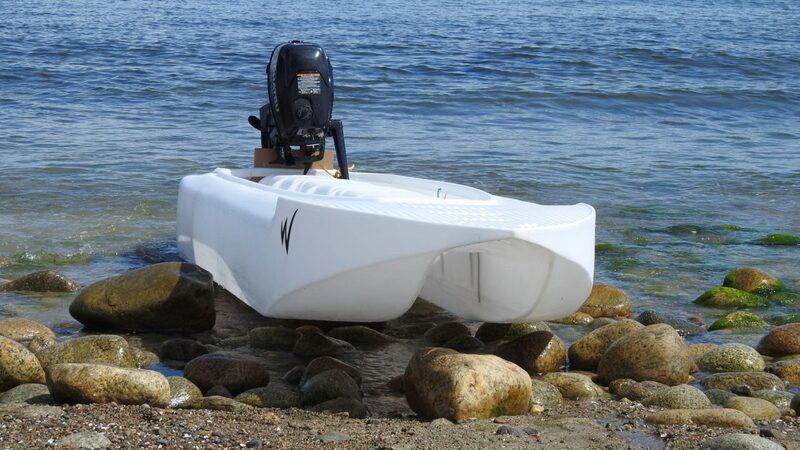 On lakes and slow moving rivers, marshes and flats, and whether it is paddled with kayak or canoe paddles, or outfitted with outboard motors and mud motors, if you’re able to see this boat, it will look good anywhere. 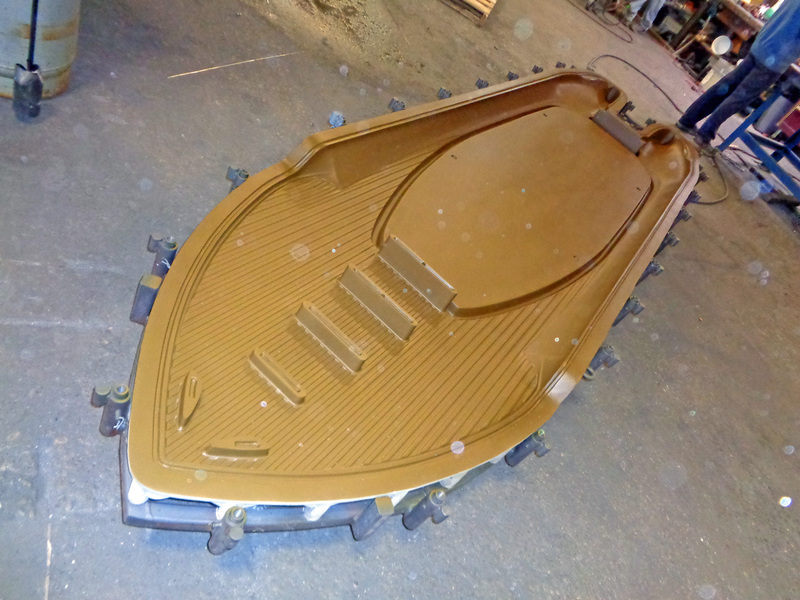 The S4 mold got coated with Teflon, and our mold makers are done with its final inspection. 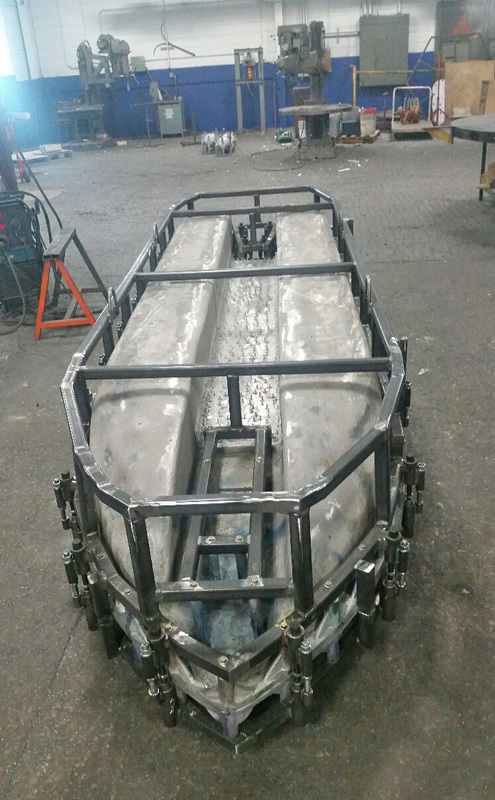 It’s on the way to its new home at the production facility where our kayaks and boats are made. 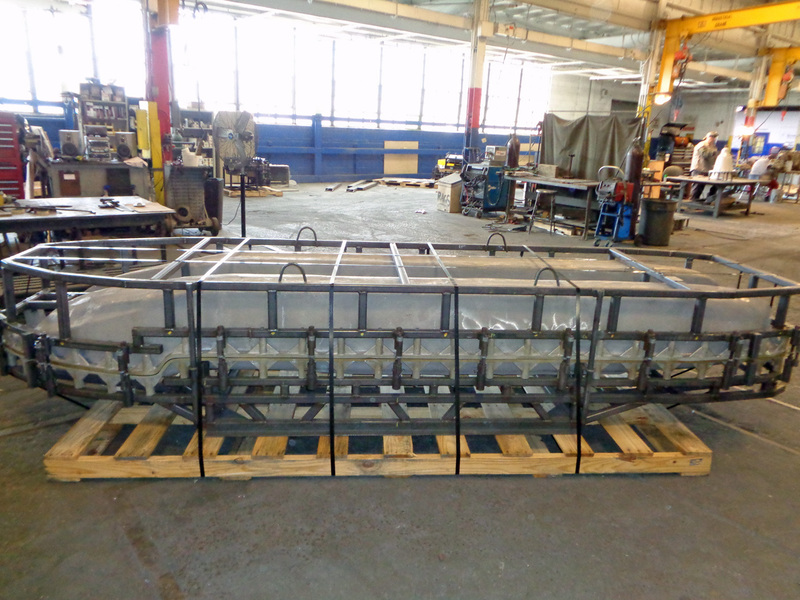 Developing and producing such a large size cast aluminum tooling is a complicated and lengthy process, and it was carried out pretty much on schedule. We are planning to produce the first S4 units next week. 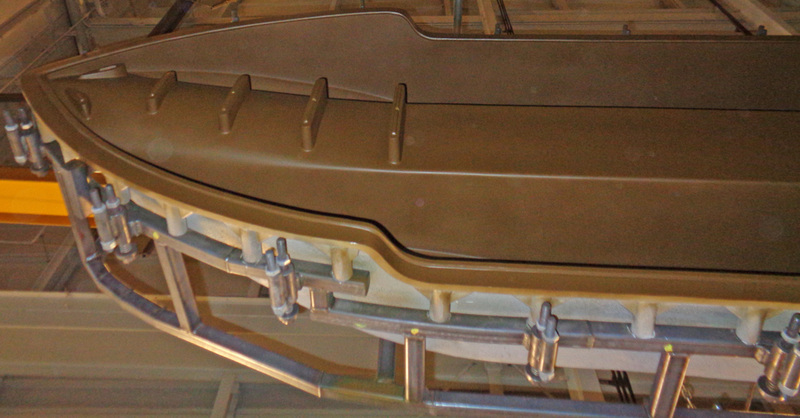 The top part of the S4 mold. 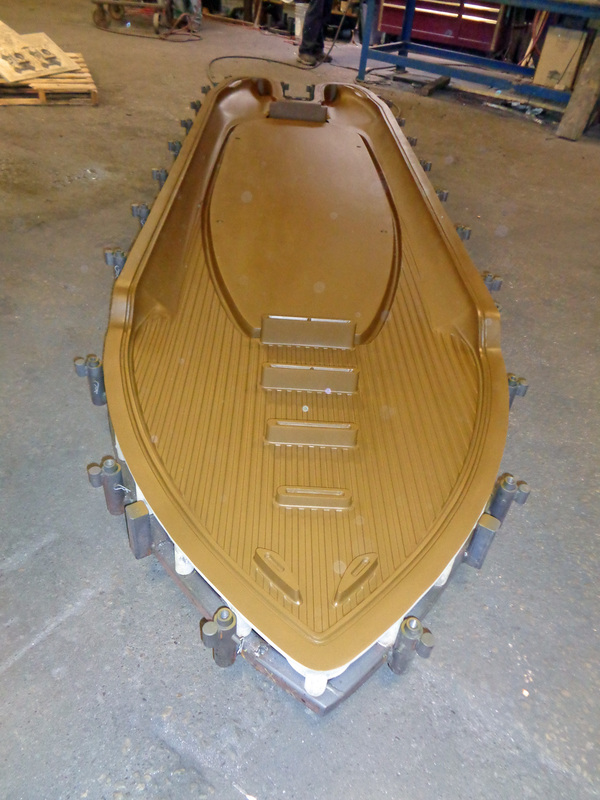 The golden-brown glossy material is the Teflon coat. The purpose of coating the inside of a mold with Teflon is to prevent the Polyethylene from sticking to the mold after it’s cooled down. 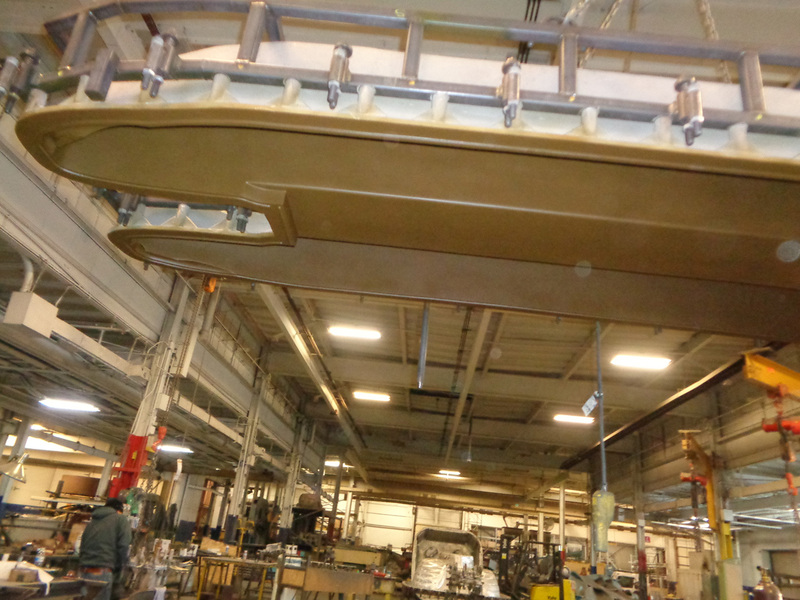 If the Polyethylene sticks to the mold, the production team can have a hard time taking the molded boat out. The mold’s top part viewed from another angle. 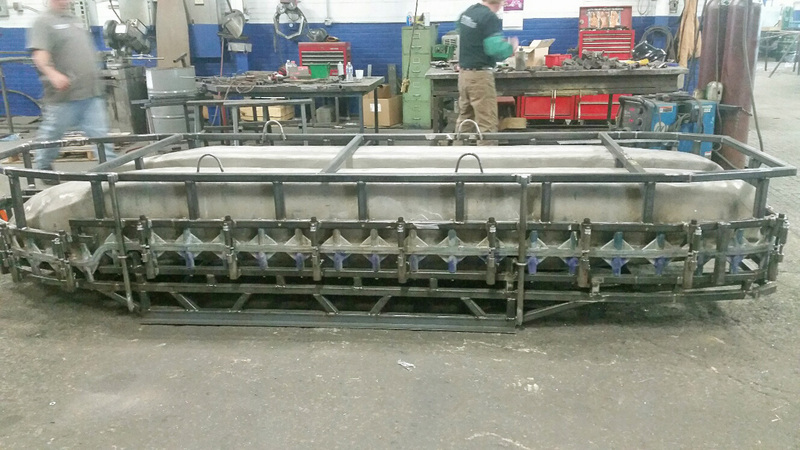 The cast aluminum mold is completed, and the mold makers are finishing the steel frame around it.